Ok, so I know it's not a glamorous picture, but I thought I'd post a picture showing the state of the rust on Lady Jane's hull from close up. This patch is a particulary hard patch of rust. Click on the picture for a larger image. You can click here to get an even bigger picture if you really want to. I'm used to cruising through a good stretch in an afternoon but, for some reason, just this small section took me hours to chip away the rust. 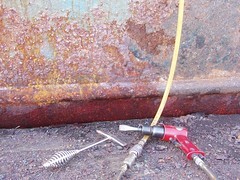 You can also see my air and chipping hammers, two of the tools I've found most useful for "rust busting". Once the hull is painted, Lady Jane will look like a million bucks. The swans are fine. 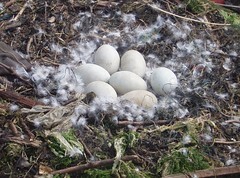 I see Mildred has laid a few more eggs. 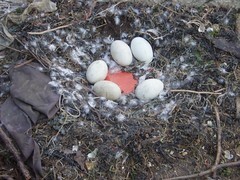 I had not really thought about it, but assumed she would have laid all her eggs in one go. Obviously not. George is going to have his work cut out for him once all these eggs hatch. For those of you who read this blog regularly, you may have noticed I've not had too much to say about progress on boat projects recently, but plenty to say about all sorts of other stuff. The reality is that I'm progressing slowly, but steadily, with the painting the hull project. The problem is there is only so much I can say about it without being repetitive or dull. By way of a change, for myself as much as anything, I switched back to deck projects for a bit. I've continued work on cleaning up the deck. 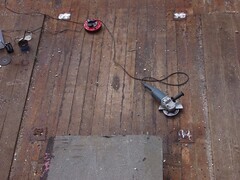 The picture shows the remnants of some deck fittings which are now cut and ground flush with the rest of the deck. When I'm finished with the cleaning up of the deck, it will be a safer place for the various 'tourists' I get on board from time to time. I'm pleased to say the muddy swans, George and Mildred are fine. When I arrived at the boat, George was floating in the water near Mildred who was asleep on the nest. Later in the day, George was asleep on the platform, near the nest. As the tide started to go out, George swam by as I was working away on the hull. Much later in the day, with the tide on it's way back in I heard Mildred squelching through the mud right by me as I stood on the platform by the boat. I wish my camera was nearby, as it would have been a great picture. I could not resist, but go and take a peek inside her nest - the nest is easily visible from the quay edge, which is where I took the photo from. It looks like we are due for five baby swans - cygnets I believe they are called. I'm still amazed at the state of the nest. I wonder if I'll be doing the swans a favor for next year if I clean the platform up once they are finished with the nest this year? It has been over two weeks since I was last on the boat, a little longer than I anticipated. In that two weeks, the fridge has been left running in less than optimum conditions, under a board with no ventilation holes. When I got on board, the battery voltage was at 23.8 volts, a little below what I had expected (24.5 volts), Though the fridge is designed to run under a counter top with no ventilation holes above the back of the fridge, I suspect this is not too efficient. The board was there simply to protect the top of the fridge from the inevitable grimy bits and pieces that get left lying about. I never put any ventilation holes in because I was always busy with other stuff and was not really using the fridge anyway. Now, as I had originally intended, the fridge is packed in polystyrene to provide better insulation, both on the sides and on the top, with more polystyrene against the steel wall behind the fridge. The board above the fridge also has a proper ventilation slot cut into the back of it. 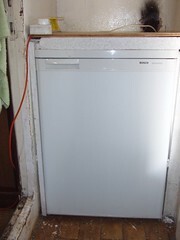 Soon, I intend to install a freezer below the fridge, with the fridge in the space you can see above it. I believe that, properly insulated, I should be able to run both of these comfortably using only the wind generator. 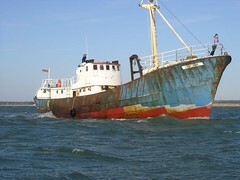 That is providing the wind co-operates of course, Lady Jane is very sheltered where she is currently berthed at Fareham. I'll know soon enough if the insulation and proper ventilation of the fridge has done the trick. Normally on a boat so much fridge/freezer space is extravagant, but this is our house by the sea, so why not make it as comfortable as possible? Note that the scorch mark you can see above the fridge is the result of welding a hole in the steel wall behind the fridge closed. I need to do more work on this space, including painting, before the freezer can finally be installed. I've been down to the boat, more about that later. My big news is that Lady Jane has made me some money already. Ok, so it's only 20 cents (US), but it's a start. What happened was I uploaded some of my photographs to Shutterstock, a photography site which pays photographers a royalty for pictures their customers download, and I see from the statistics that someone has downloaded the picture I took of Lady Jane at sea. Another project I could add to the list would be to spend time on Lady Jane taking pictures people may want to download, you never know. At last, I should get down to the boat tomorrow. Thank goodness for that as I've been running out of material, having to stoop to posting rants. On the subject of rants, I didn't mention using mobile phones in the car - while speeding. From the number of people I see driving around with mobile phones to their ears, it looks like the fines introduced for drivers using mobile phones have proved useless. I was once on the phone with someone who was using a mobile phone in their car, P you know who you are, when they crashed into the back of another car. It's hard to know what to say to someone in such a situation. P phoned me, but I still felt guilty that P crashed. No injuries though, I'm pleased to say. What I just don't get is why so many people here in the UK are so anti the speed cameras which now litter our roadsides. If speeding was not such a problem there would be no need for the cameras. It's not the camera's fault, or anyone else's for that matter, that people get caught speeding, they just have themselves to blame. It seems pretty simple to me, if people don't want a fine and points on their licence, they should not speed. It is, after all, the law. Ok, so speed cameras don't look so good, but I can say from experience that being caught, and fined, a few times helped modify my speeding habit pretty quickly. Especially after the last big fine. Rather that than I hurt or even kill someone I suppose. For you folks outside the UK, some fines here can be 'means tested', meaning that a fine can be racked up, or down, dependant on your earnings. The idea is to ensure that better off people hurt just as much as everybody else when they get fined for an offence. Unsurprisingly, there is no boat progress to report, so I think I'll have a rant instead. I've been travelling on our roads and motorways a fair amount recently, and just cant help getting annoyed with the selfishness displayed by so many people, male and female alike. For example; It's not difficult, let people who want to pass into the lane, let them pass the car(s) in front and they will pull back over. Some drivers are just plain dopey I know, but I suspect the majority of people who 'hog' the middle or fast lanes do so because they know they will not get let in by those selfish people who seem to think they are so important that slower, or lesser, cars should not be in their way. I bet those self same selfish people have a bit of a double standard, as they probably hate not being let in themselves. This selfish attitude is endemic in our western society, fostered, I believe, by organizations such as McDonalds, where people are not encouraged to form orderly lines (queues in the UK) for their meals, but to scramble for the nearest available server, regardless of how long other folk have been waiting. I really hate it when someone gets served immediately and I've been waiting forever. McDonalds is very much a company which caters for children, therefore youngsters are armed with this kind of 'me at the expense of others' mentality right from the beginning. I'm not lovin' the kind of example McDonalds, and of course others, set. At least the utility room project is almost complete. It comes as no surprise that things have taken longer than planned. As you can see, the plaster is still not quite dry, so painting the walls has been delayed. 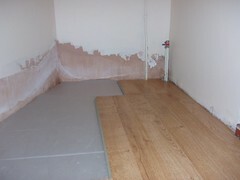 Laying the floor suffered a similar problem, as the floor levelling compound we put down was slow to dry. Truth be told, if we had more time I would probably put down more levelling compound as the floor, although good enough, is still not completely flat. We should have the flooring finished and painting complete today. This means the all important washing machine can finally be hooked up and the utility room will be ready for the puppy, which arrives tomorrow. With the arrival of the puppy, I don't see myself getting down to the boat anytime soon. I've been getting a lot of hits from grow-a-brain for some reason just recently. If you've got a lot of time to waste, you could do worse than visiting this place. No progress to report on the boat yet - domestic duties have taken over for the time being. We are getting our new puppy on Monday and, like so many 'simple' jobs, the conversion of the utility room into a haven for the dogs has not gone entirely to plan. 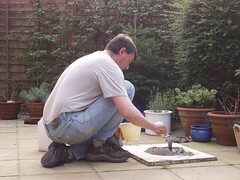 The picture shows me mixing some mortar, to repair some of the holes we discovered in the utility room wall. All we have left to do now is to plaster the walls, paint the room (at least twice), finish leveling the floor, underlay and lay the new laminate flooring, fit and paint the new skirting board, plumb in the washing machine, build and install the new cupboards, clean and move everything that should be there back into the utility room, all by the end of the week. Somehow I don't think I'm going to be spending a lot of time on Lady Jane any time soon. Wayne from Broke Boats sent me an e-mail recently to remind me "not to neglect the rib in the midst of your other projects". 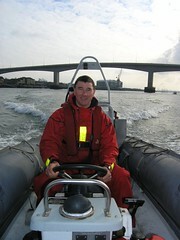 If you are into boats in any way it's worth checking out Wayne's website, as it is loaded with useful information and he seems happy to help if you can't find the answers to your questions on his web pages. Wayne also went on to advise me on a few key items he recommends should be checked out on the engine. It's a long e-mail, completely unsolicited, and filled with useful advice. I've copied a short section here just to show the type of thing Wayne sent. I always check overheat alarm systems on every outboard that comes in whether they request it or not. It only takes a moment and I don't charge for it. The other un-requested check I always make is condition and level of lower unit gear lube. I feel it's two important prevention measures in predicting and preventing major problems. Overheat sensor is the unit on cylinder head with tan wire going to it. When wire is grounded (with switch in on position) the overheat buzzer should sound. You should change the lower unit lube twice a year since lube is cheaper than gearsets. I have directions and pictures for that here: http://www.brokeboats.com/lulube.html http://www.brokeboats.com/lulube3.html You can buy the lube right at Walmart or a NAPA auto parts store, you want the Hi-Vis lube...not the electric shift Type-C lube. Buy 3 -10 ounce tubes and you'll have a few ounces left when you're done. It's nothing special, just 80-90 weight gear lube but it MUST have low foam characteristics so it's best to buy one marked for outboards to start with. Thanks for the reminder and the advice Wayne, it really is appreciated.